IBAGUÉ, Colombia, Feb 6 2012 (IPS) - “In the Andes, and all over the world, mining on mountains should be banned. Distinguished scientists and papers in the most prestigious journals are saying this,” a regional planning expert in Colombia told IPS. 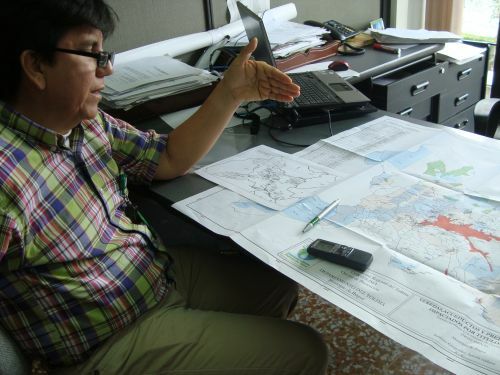 The expert in question is forestry engineer Fernando Mauricio Castro, in charge of planning for CORTOLIMA, the top environmental agency overseeing natural resources and their sustainable use in the central Andean province of Tolima, with its capital, Ibagué, located 202 km southwest of Bogotá. Castro’s criticism was aimed at the South African mining company AngloGold Ashanti (AGA) which has been prospecting and exploring in this mountainous area since 2006. The company’s gold mining operations were authorised by the state Colombian Institute of Geology and Mining during the administration of rightwing president Álvaro Uribe (2002-2010), which has been criticised for issuing mining licenses even in national parks and other protected or especially fragile areas. The mining concession granted to the South African corporation, which is the world’s third largest producer of gold, is one of 9,011 legal mining permits listed in the Office of the Comptroller General’s report “Estado de los Recursos Naturales y del Ambiente 2010-2011” (State of Natural Resources and the Environment 2010-2011). In addition, the report says, there are another 9,420 illegal mining operations, or 409 more than those formally approved. Uribe’s successor, moderate rightwing President Juan Manuel Santos, has described mining as the chief among five engines driving Colombian economic development, termed by the government “development locomotives”. Colombia is Latin America’s top coal producer and also has large deposits of gold, ferronickel and other minerals and precious stones. The mining sector, like the fossil fuel extraction industry, has grown to record levels in recent years. Official forecasts indicate that mining output will grow at 8.5 percent a year over the period 2011-2014, and 40 transnational corporations are in-country for a slice of the action. AngloGold came to Tolima over a decade ago to conduct exploratory studies in the municipality of Cajamarca, with a population of 23,000, located 35 km west of Ibagué. Cajamarca is situated at 1,814 metres above sea level, and is nicknamed “Colombia’s agricultural larder” because of the abundance of its farm produce. The area holds important water resources, with a cluster of at least 160 springs of water and the Coello River basin, as well as high moorlands, cloud forests, and forestry reserves for protective and productive purposes. But in a protected area close to Cajamarca there is also the La Colosa gold deposit, with reserves estimated at 12 million ounces, one of the largest gold deposits in the world. The government and AGA are promoting what will be South America’s largest opencast mine, unless the project is halted. La Colosa is a bone of contention between environmentalists and those who support mining development, and is seen as a test case for the kind of mining Colombia will have in the future, as well as for whether the government will honour its promise to revoke mining licenses in environmentally protected areas, granted by the previous administration. Meanwhile, AGA has started to add to the area of land it owns by buying up plots from small farmers, so that in practice it has expanded its concession right up to the location of water supply pipelines that are vital to the local population. AGA has kept a low profile in its activities and the regional media have maintained silence. “They do not publish information, neither do they promote needed debate. On the contrary, they highlight the resources that AngloGold will supposedly contribute” to the area, said Castro. The engineer has been part of CORTOLIMA’s working group since it carried out an analysis of mining concessions in the region, which resulted in some unpleasant surprises. “We found that both inlets of the aqueduct that serves Ibagué are situated in part of the mining concession,” he said. The city is home to 600,000 people. “And that is not all. Since the capacity of the aqueduct is dwindling, we made great efforts to obtain the resources to build another aqueduct,” he added. Some 900,000 dollars have already been invested in the project, out of 37 million dollars approved from national and regional funds. “But a mining concession covering the river has already been granted,” which could prevent construction of the new water supply system, complained Castro. “It’s extremely worrying. Private interests are being given priority over the common good. It won’t be possible to acquire strategic grounds to protect and guarantee water to supply present and future populations because of the cost involved,” he said. Some entire rural villages like San Cayetano, Buena Vista and Santa Teresa are situated within mining concessions, as well as the piped water supplies for many of the population centres in the area around Ibagué. The social protest movement against the mine, made up of students, social leaders and over 25 social organisations, is still active, but “it is David fighting Goliath,” Castro said. “It is true that valuable work is being done by those who do not agree with mining exploration in such fragile ecosystems,” he said. “Sadly, though, it must be said that AngloGold’s large investments here indicate that it intends to stay, with no plans to leave. Therefore the most likely scenario is that in a few months’ time the ministry will issue the mining company an exploitation license,” he added. To make matters worse, the mine will extract ore by the opencast method. “The mountains will have to be ground to pieces and whole layers of rock be removed to extract low quantities of gold. Then at an altitude of 3,000 metres, tanks and dams must be built to treat the ore with cyanide and so separate the gold from other metals,” Castro described. The proposed mine site is “very close to the Machín volcano, which is in constant activity,” he said. CORTOLIMA “is calling attention to the serious environmental impacts that (the mine) will have on the region, and insists that this project is incompatible with sustainable development. But the decision is up to the ministry,” he said. All the environmental damage will only produce materials for luxury industries, experts and activists complain. “A study by the Environment ministry states that 90 percent of the gold is used for items of luxury consumption,” geologist Fierro commented. President Santos, for his part, insists on the importance of legalising mining and protecting water resources. “It is deeply distressing to see water sources and rivers become polluted. That is why we are going to put an immediate stop to illegal mining, and that is why I have come to tell you that the government is on your side,” the president said Jan. 6 in the mining community of Norosí, in the northern province of Bolívar. But his statement has come under fire in Tolima, where exploration activities by AGA would damage the region’s greatest cluster of pristine water sources beyond recovery. “Neoclassical economists always end up justifying environmental destruction. It’s happening now in Latin America, under governments of different political stripes. Therefore it is increasingly clear that there is an urgent need to develop resistance on a regional basis,” Fierro concluded.